Our Viwawa pet robot (from NumeroidZ) has picked a new winner this week, out of 227 Blog and 149 Twitter followers. chinzeliang has won the free 100 Viwawa cash for our Weekly Viwawa Follower's Contest. Please either include your Viwawa username in your Blogger profile, or simply use your Blogger account to comment on this post with the username, and we will credit that Viwawa account with the free 100 Viwawa cash. 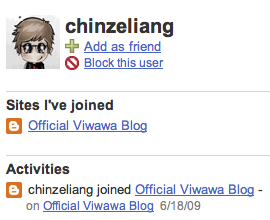 yea,i'm the winner of Viwawa followers contest week 29th June 2009! !